The next character coming to Smite is Cerberus, the Warden of the Underworld. Here’s what we know so far about the new character’s abilities, matchups, and lore. Smite’s getting a new conquest map for season five, and it’s part of the game’s “biggest ever” gameplay changes. A member of the Greek pantheon, Cerberus is the mythological warden of the Underworld, and was in charge of stopping the souls of the dead from escaping. In-game, Cerberus is an aggressive guardian, a magical god with a lot of tanky stats, but who, according to Smite lead designer Ajax, he’s “the kind of guardian that does more protecting by attacking, as opposed to casting buffs or shields on teammates,” not dissimilar to Ares, Sobek, or Bacchus. Some of Cerberus’ abilities were also revealed. His passive is an anti-heal that reduces the power of heals cast around him and allows him to heal for some of the difference, making him a potent threat when picked against healers. Another ability allows him to leap on enemies and knock souls from their bodies, which Cerberus can then consume to heal himself. Other abilities are focused on AoE crowd-control and slows, while his ultimate is “a big release of souls that throws all enemies up and then throws them into this specific spot,” making him an excellent synergy god, particularly alongside characters such as Ra, Scylla, or Poseidon. As a character, Ajax says that Hi-Rez were keen to develop Cerberus beyond the wild beast that he is often portrayed as; “we like to think that he is not just a dumb animal being told what to do, but he understands that his purpose is really important, and he treasures it. We gave him more of a personality and a voice that makes him feel a little bit more intelligent, so he’s not just growling and snarling, and overly violent. 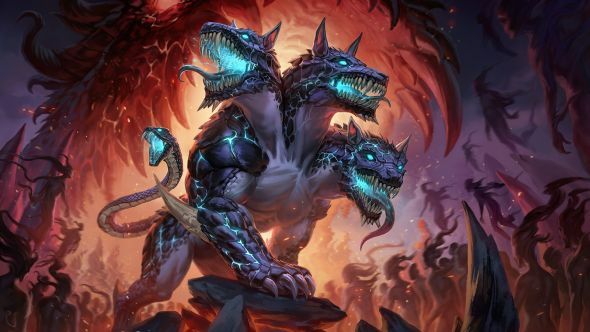 Cerberus is due to arrive on the battlegrounds with patch 4.25.